Is My Pine or Spruce Tree OK? Starting in late summer, many homeowners begin to see the interior needles of their pines, spruces, and cedars turning yellow or orange. This is normal. 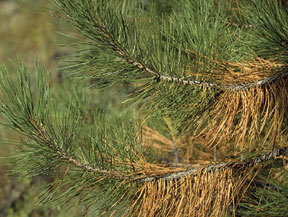 Needles only live for a few years (depending on species) and then die back during fall. It is common for people to think that something is wrong with their trees. If your pine tree looks like the picture above, don’t worry. If needles are dying back on the tips (ie. the new growth), then you may have an entirely different problem, such as a fungal disease, or drought issue.